This spring is quite unusual for residents of Komarna, a small village in southern Croatia known for its wines, oysters and peacefulness. Resounding metallic bangs now echo in the narrow bay between Komarna and the Peljesac Peninsula. A huge pile-driving barge from China has been knocking steel piles as long as 130 meters into the Adriatic seabed since January. A bridge is being built. About 70 km farther south, the city of Dubrovnik is warming up for another tourist season. The ancient town is the main filming location for “King’s Landing” in blockbuster TV series “Game of Thrones” and has become a must-go destination for visitors to the southeastern European country, whose economy depends heavily on tourism. In order to reach Dubrovnik by road, travelers must pass the Neum Corridor, a piece of Bosnia and Herzegovina’s territory that divides Croatia’s southernmost Dubrovnik-Neretva County into two parts. Going through border checkpoints at both ends of this 20-km-long costal section can be unbearably time-consuming in summer, when vehicles wait in long queues for border control. The Croats were quick to realize the necessity of building a bridge linking the mainland with the Peljesac Peninsula so as to bypass foreign territory. The project started about a decade ago but had to be terminated in 2012 due to financial difficulties. In January 2018, a Chinese consortium led by China Road and Bridge Corporation (CRBC) won the bid for the first phase of the Peljesac Bridge and its access roads, with the promise to finish the job in 36 months. The European Union (EU) funded 85 percent of the project’s total cost. Construction officially kicked off in late July. China is a showroom of numerous mega infrastructure projects, and Chinese companies have been leading bridge-building endeavors globally in the past decade. 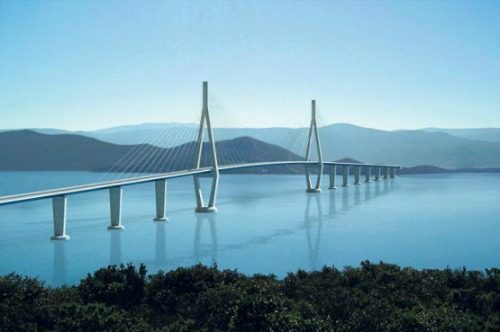 However, the construction of the Peljesac Bridge is challenging and requires some unprecedented efforts, said CRBC’s contractor representative Zhang Dong. The longest steel piles used for the foundation of the bridge are 130.4 meters long, around 10 meters longer than average. The main designer of the bridge, considering the capacity of pile-driving barges, originally suggested piling shorter pieces and then welding them together to reach the required length. “In order to reduce the safety risks of joint-welding, we proposed that a larger barge should be mobilized and the piles should be fabricated and driven into seabed in whole,” Zhang told Xinhua, referring to the “Xiong Cheng 1” pile-driving barge, which was carried by semi-submersible barge “Zhen Hua 7” from Shanghai to the site in late December 2018. “Xiong Cheng 1” started work in January, and despite windy weather, it has so far driven more than half of the total 150 steel piles into the seabed, faster than planned. The Mali Ston Bay, where the construction site is located, has its reputation as one of the cleanest water bodies in Europe. Oyster cultivation has been a local industry since the ancient Roman Empire. The Chinese contractor understands the strict environmental standards of the EU and has hired local consultancy firms as well as environment engineers for help. It has stocked oil dams and absorbent mats in case of oil leaks. Mobile toilets and garbage containers are used on all construction vessels, and sewage disposal systems are being built for temporary container dormitories on the Peljesac Peninsula. “Our goal is that when we leave, the water will be as clean as before,” Zhang said. The contractor representative also singled out noise as an environmental hazard, saying that the issue is most prominent at the current piling phase and CRBC uses air bubbles to muffle the noise from piling. Nowadays, a major infrastructure project like the Peljesac Bridge is usually done through international cooperation, said Zeng Linghua, CRBC’s administrative manager. CRBC has managed to find partners from Croatia and other European countries. Croatian multinational oil company INA provides diesel for the project, Croatia-based building material provider PGM is responsible for 70,000 cubic meters of concrete, maritime service company Marine Construct specializes in geological survey, and Slovenian company SLP offers pile testing and monitoring experts. Some reinforcement bars are purchased from a steel plant in Bosnia and Herzegovina, while an Italian factory sells the thicker version of them. The German manufacturing base of China’s Sany Heavy Industry has sold truck cranes, concrete mixers, trailer pumps and caterpillar cranes to the contractor, while Volvo trucks and traffic boats were purchased locally. Workers on the project are from China, Croatia, Bosnia and Herzegovina, Serbia and Togo. The Chinese contractor also went to the University of Zagreb in November 2018 for a recruitment session and managed to sign six job contracts with graduates. “CRBC offers suitable salaries and welfare for all employees based on work positions according to local and EU laws,” said Zeng. Meeting with representatives from CRBC and its parent company China Communications Construction Co., Ltd. in late March, Croatian President Kolinda Grabar-Kitarovic said that the construction of the Peljesac Bridge has opened a new chapter in Croatia-China relations. While visiting the construction site in late January, Croatian Prime Minister Andrej Plenkovic said the bridge is of great importance for Croatia and it creates a new dimension of cooperation with China. “At the same time, the fact that the project is funded by the European Union budget with 357 million euros (about 401 U.S. dollars) shows the importance of the EU cohesion policy and the EU’s help for the project,” said Plenkovic. Zhang Fei, deputy chief engineer of the project, is one of the Chinese staff living in the nearby village of Komarna. “Croatian people are very friendly and are eager to see the bridge project finished,” he told Xinhua. Zhang’s landlord, Ivo Jerkovic, a CRBC subcontractor as an accommodation provider, shares similar feelings towards his Chinese tenants, saying that he is impressed by Chinese people’s diligence and serious attitude towards work. The 24-year-old entrepreneur is decorating another restaurant a few meters from the shore, which will serve both Croatian and Chinese food. He plans to open it in June when there will be more tourists, and is looking for a Chinese chef.